The terms “wireless” and “gaming mouse” are rarely juxtaposed, and for good reason: Gamers never want to be caught in a situation where their mice batteries die while in the heat of battle. 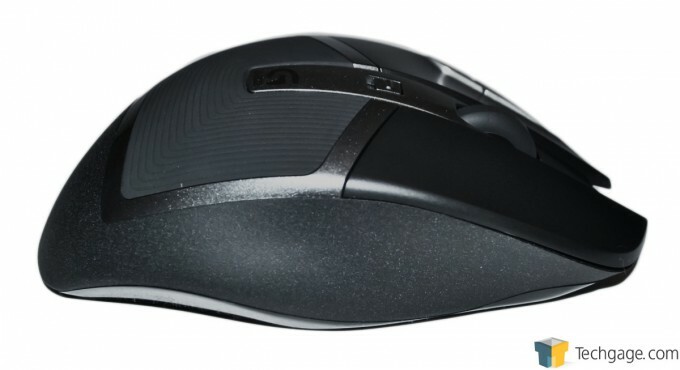 In this regard, Logitech claims its newest wireless gaming mouse, the G602, is a game-changer. Fortunately, it sent us one to see if we agree. Most gamers I know don’t trust wireless gaming peripherals. Cable clutter is no problem; they’d rather have that kind of potential mess than suffer from the traditional problems that afflict wireless gear. Especially for competitive gamers, disconnections, input lag, and, worst, dead batteries are analogous to being caught with one’s trousers bunched around one’s ankles in socially-awkward contexts. 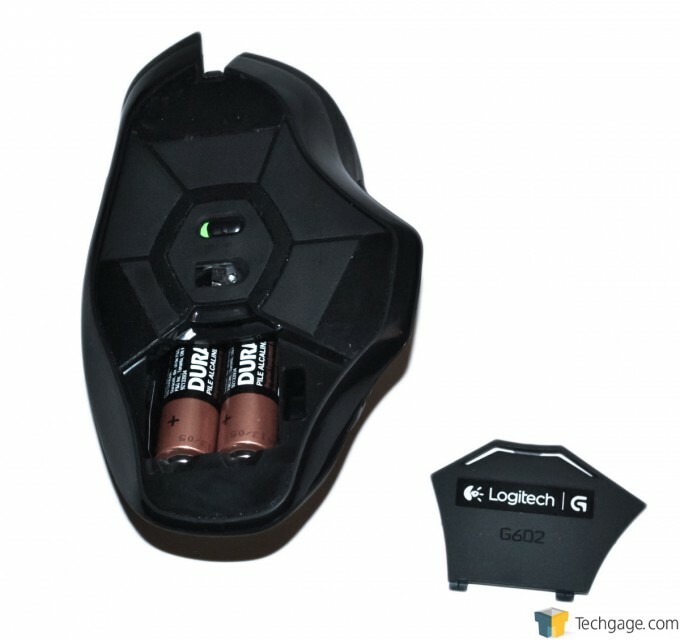 Well, when Logitech first announced the G602 wireless gaming mouse back in late August, it claimed that its newest wireless wonder could survive up to 250 hours on one pair of AA batteries in its hungry Performance Mode (and up to 1440 hours in Endurance Mode!). These claims certainly caught my attention, since they addressed my biggest misgiving regarding wireless gear. Even though I’m not a competitive gamer by any means, I can think of no worse scenario than for your mouse to just conk out on you in the middle of a heated battle. It’d be a lot like running out of ammo right in the middle of a firefight. I was glad when Logitech offered Techgage a sample of its G602 since I want to see if a wireless gaming mouse could be a viable option for gamers. But before we put it through the proverbial wringer, let’s have a good look at it. This is easily one of the most aggressive-looking mice I’ve ever seen. Its sculpted flanks, asymmetrical profile (this is strictly a right-handed mouse – sorry, lefties), and eleven programmable buttons to push all scream “gaming mouse.” The black and grey metallic color scheme is austere, yet likewise reinforces that impression. Here you can see eight of the G602’s buttons. There are six buttons (labeled G4 through G9) in the thumb position, while two more (G10 and G11) are at the edge of the left click button. The right profile shot doesn’t reveal much, although it does show off the G602’s right-click button and the textured lower surface. 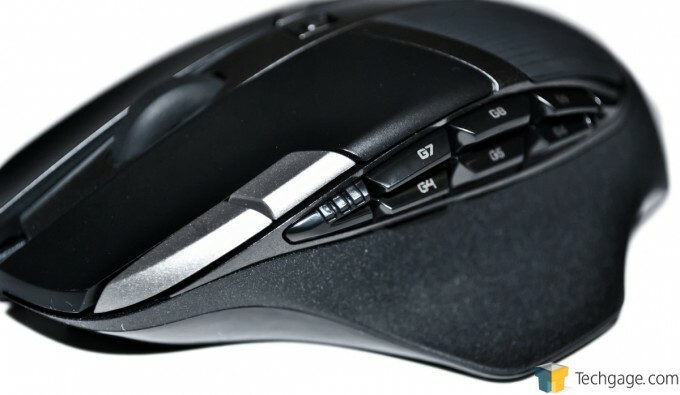 The photo also gives an impression of how the mouse’s dorsal surface falls away on its right side; this raises the inside of the user’s right hand, angling it for optimum ergonomics and comfort. This shot shows the left flank and rear of the G602. 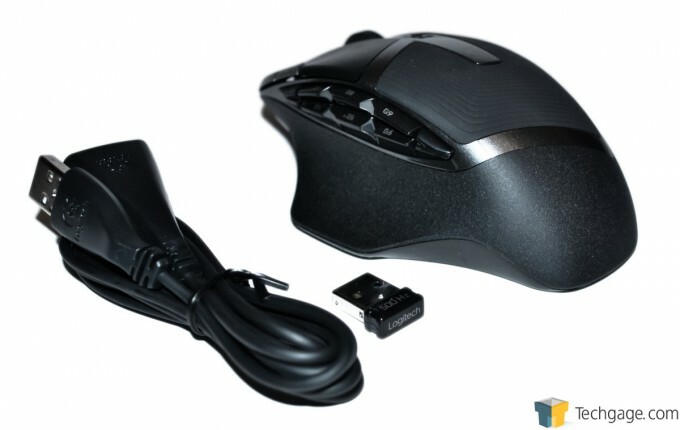 The sculpted flank is a thumbrest, well-shaped and designed to help you grip the mouse. 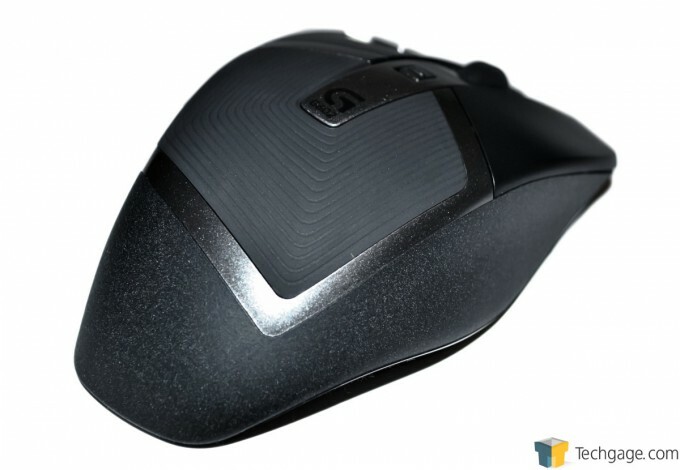 And speaking of grip, the lower sides and rear of the mouse are treated with the same rough surface as we saw on the G602’s right profile in the previous photo. 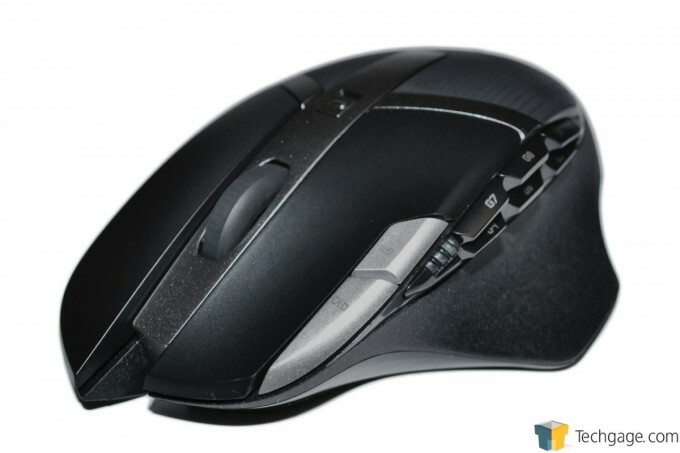 Most of the middle third of the mouse is treated with a less grippy dark grey plastic. While this doesn’t enhance grip, it does provide some tactile variety. This angle gives a better view of that less grippy midsection of the G602. You can also see the very discreet “G602” branding. More than anything, though, it shows off the variety of surface treatments on the mouse (signified by the variations of shades of grey/matte black). 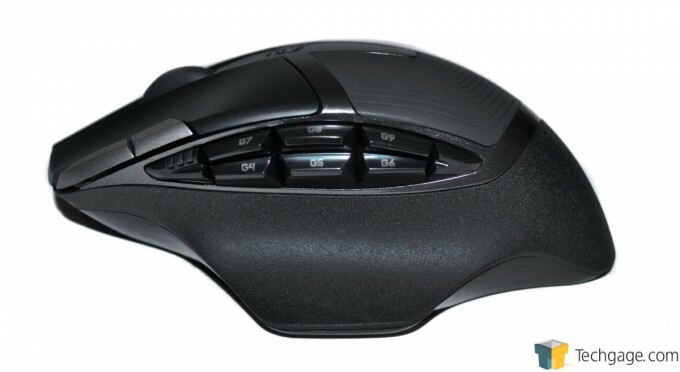 As previously mentioned, the G602 has eleven programmable buttons. You can clearly see the six thumb buttons clustered above the thumbrest area. The silver pair of buttons are G10 and G11, which adjust the DPI settings by default. With the left- and right-click buttons and clickable scroll wheel, you can see all eleven buttons in this photo. Also, a little out of focus is the sliding switch for Performance/Endurance modes. Performance mode is indicated by blue LEDs just aft of the scroll wheel, while Endurance mode is indicated by green LEDs. And now, a look at the bottom of the G602. Just south of dead center is the Delta Zero sensor emitter; above it is the mouse’s On/Off slider switch. Below the sensor emitter is the battery compartment. There are four good-sized foot pads on the G602. 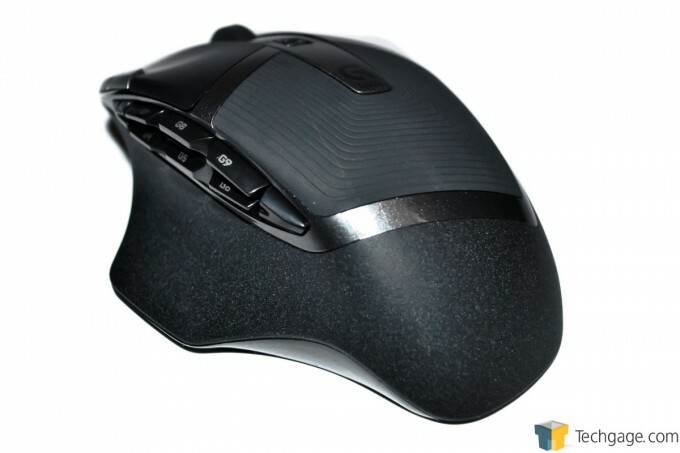 The G602 package is composed of the mouse itself, the wireless nano-receiver unit, and a USB extender cable which facilitates optimum placement of the nano-receiver for best performance. Two AA batteries are included and come pre-installed in the G602. Now that we’ve had a good look at the mouse, let’s proceed to the software component of the package.